Had a hard time picking something for this. Took tons of pictures which looked fine as abstracts till I converted to B&W, at which point ... yuck! Settled on this one for the patterns. They're Morning Glory buds. PP - converted from RAW, rotated, cropped, levels, increased contrast, converted to monochrome, added border, resized, sharpened with noise reduction. This looks quite fine in B&W. I love the way subtracting color renders shape and form more prominent. The swirlies are wonderful! 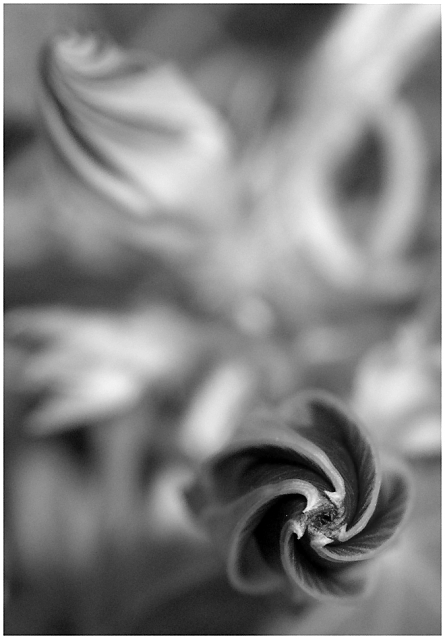 Very nice use of a shallow DOF to render a common subject into a more abstractive work. Perhaps a little too much on the top, placing the focal subject too near the framing for my tastes, but nicely done otherwise. Proudly hosted by Sargasso Networks. Current Server Time: 04/21/2019 04:05:22 PM EDT.